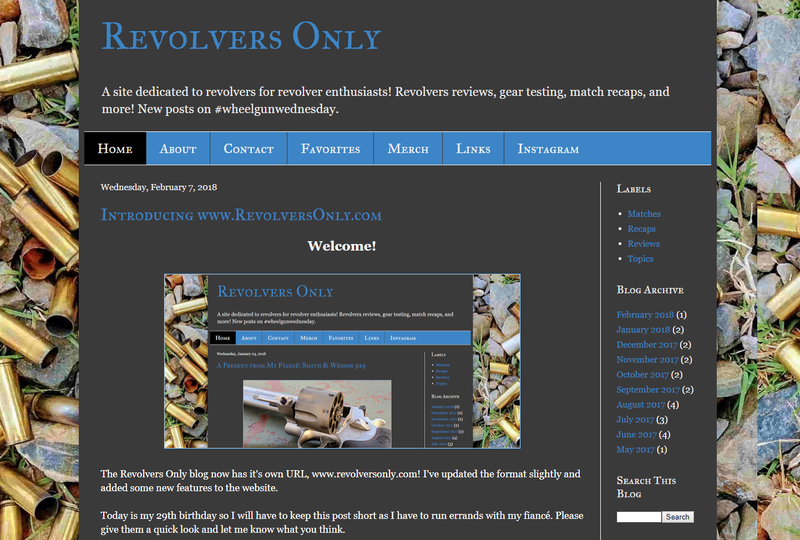 The Revolvers Only blog now has it's own URL, www.revolversonly.com! I've updated the format slightly and added some new features to the website. Today is my 29th birthday so I will have to keep this post short as I have to run errands with my fiancé. Please give them a quick look and let me know what you think. I hope everyone enjoys the changes! Aside from the new URL address, I have added some new pages! An Instagram link to the Revolvers Only Insta. I may change the order and even add more pages in the future so don't forget to take a look ever few visits for any updates! I have plenty of new content coming as I've been shooting several matches since the new year began. I've also borrowed several revolvers from friends and family for review. I am working with a friend on creating a YouTube channel with match videos and reviews so look for that in the next few months as well. I really appreciate all the readers who have keep coming back for content and hope that any new readers will like what they see and return!